She would have said it with a jutting chin, no hint of a smile and without making eye contact, which is how we would know she was teasing and was touched. From her vantage point then, though, she would seem quite right: reciprocity is not a great driver of attendance at funerals; neither, I think is the tea, though it’ll be much appreciated. Life, in the living of it, seems celebration enough of itself and when it has gone the proper focus for those remaining would seem to be the same glitteringly immediate stuff of the living of life. Yet here we are. Our vantage point today, just for a while, is from the other side of death. We are not here for the tea. We are not here in hope that if we come to hers she might come to ours. We are here because we choose to see beauty and value in this most unlovely of all events. We are here because it turns out that we don’t, actually, have anything better to do than celebrate the joy of Gill’s life and, as the community of those who remain, to share in the sorrow of her passing. It’s been a year today and while the everyday has flooded back like a tide, reality is changed since she flits unbidden and unexpected in and out of moments like an almost-seen but familiar face in a dream. This year, for the first time since returning to South Africa from England, May felt like Autumn, not Spring, and the usual autumnal wanderlust bit deep. Autumn was made for walking. At latitudes where the seasonal change is stark the reasons are obvious. “I could walk all day” becomes a mere 6-hour commitment, preferably with a measured break for lunch at a good pub. Ah, well. Autumn came in May this year, there were no walks – and certainly no good pubs – but rather a lot of sitting about in the countryside drinking excellent wine while watching interesting thoughts meander through the mind with a kind of ecstatic detachment. Rather like a sort of existential game of Pooh Sticks, really. Delicious wine is the fat of this Land and we’re thriving on it. The crisp switch into winter hasn’t all been soft and cushy, though. I have traded my triple-bladed, spring loaded, space-age branded razor for a good old safety razor. Remember those? The young call them cut-throat razors. Tush. They just don’t know what those were. These have an exposed blade that can cut; those have an exposed blade reminiscent of a machete. It’s “safety” as in “safety catch”; if you behave like an idiot you’ll still hurt yourself. The one I threw away had a supersonic name, as in “autopilot engaged, no danger here”, as in “dumbed down”, as in “boring”. This winter I will hear each individual bristle snick as it’s cut in a close wet shave. Winter was designed to make me feel alive. Six. Wow. Two weeks in, this still seems pretty strange. Name confusion has pretty much settled down now; I’m fairly confident I really do know the difference between Emily-A and Iris-’ella. The change is a bit like adding a sixth lane to a five-lane highway. Everything keeps going in the same direction, in pretty much the same way it did, but it’s wider and richer; there’s more bandwidth and more chatter, there’s more to explore and a greater overhead in management. Days start as they always did, between 5.30 and 6 with the sound of the three older girls waking and wandering through from their room to the sitting room. They close the inter-leading door to our room and choose a movie to watch (how cool is that?). After that things have changed. Little Iris wakes for a feed a bit closer to 7-ish and then I (often) get up with her and head through to the others, leaving Michelle to catch up on some much-needed sleep. There follows a ridiculous clamour as Jo and Emily contend for the privilege of holding the baby. Used to be there was competition for the first hug of the day from Dad. No longer. Dad trails through to the kitchen to make coffee and breakfast. Sometime around 7 I open the back door and don’t notice Sophie slipping out in her nighty to collect flowers. There are beautiful newly-fallen pink hibiscus to be had, as well as purple butterfly-bush trumpets and others. Sophie collects them all meticulously and arranges them on the outside table before breakfast. The rest of the day passes in a blur of reading and activities and games and snacks and meals and snacks. 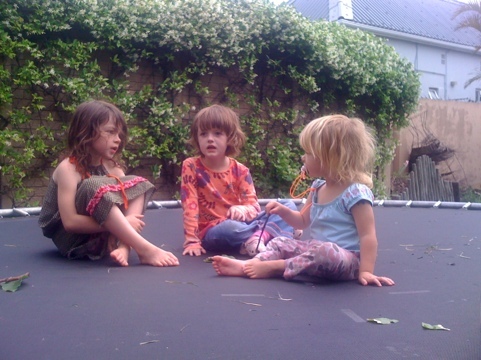 Half of today was taken up by three little girls making a picnic spot under the trampoline. It has a hard-paved square big enough for the three of them, with an adjoining fireplace. They cleared, leveled, made and transported mud, paved and decorated. It’s a marvel of modern engineering conceived of and executed by three small girls. I was astonished. And I know them. Most importantly it was a half-day of relative tranquility for mom and dad. So things have settled a bit. There’s a lot of tiredness, so highs seem higher and lows seem lower. There’s lots of maniacal laughter, heralding shrieking later. There’s a lot of fun to be had. There’s relief at bed-time. Many things stay the same. 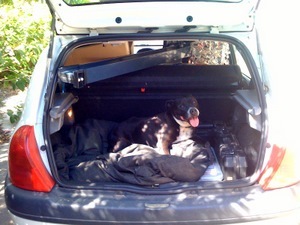 Some things change … in a car with 5 seats Dad rides in the boot. And so it came to pass, in the 775th week of their union, that Michelle and James welcomed Iris Raphaella Adlard into the breathing, seeing, feeling world. 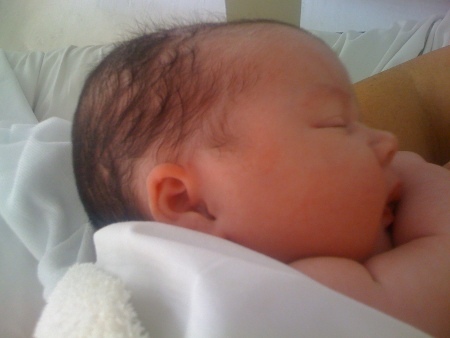 She weighed 4.34kg (9.57lb) and was 52cm long at 13.35 on the 12 February, 9 months and one week after she began. I was given some great beans for my birthday. Having utterly failed to hook up with any of the people I know with grinders I have resorted to grinding the proper way. Turns out it’s not a little satisfying, if a little time consuming. 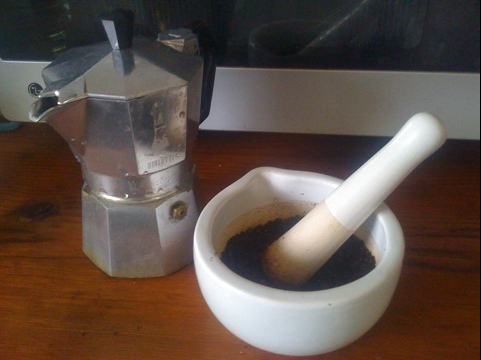 Appeals to my enjoyment of precision and ritual … I’m an artisan, not an addict. The vuvuzelas have sounded like a swarm of bees all morning here. All night they sounded more like the tractor-scaring scene from Cars. For those of you without small children or an in-built drive to watch anything Pixar studios produces, that’s a couple of cars honking their horns in the midst of a field of flatulent cattle. Honk-honk … blaaaat. It was sporadic-continuous with gaps for rain and between about 2am and 5am. It may continue for a long, long, long time. The soccer world cup, apparently, is here. Not actually in this city, you understand, but near enough to warrant blowing a plastic trumpet for 24 hours straight. Ruby is being returned to the proverbial bosom of her family. What excitement there will be 1100km down the road! Hopefully not too much excitement during those 1100km .. still, it will be nice to have someone to talk to. I drove to Cape Town on Saturday to prepare the house for packers. For those of you unfamiliar with the geography and/or process, that’s about twelve hours driving, two days dismantling-arranging-cleaning-preparing, a day entertaining packers, and a day entertaining packers and loaders (which is today). 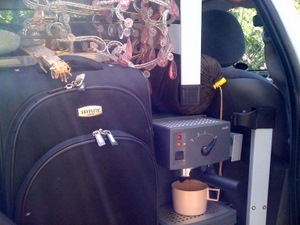 The extra-large espresso receptacle is an optional extra if you’re interested. The best, though, is yet to come: twelve hours back home with Ruby in the back of the packed car. Woohoo! We moved into our new house on Thursday last. What incredible excitement! When I imagined the girls coming to the house I hoped for excitement but couldn’t be sure they wouldn’t be unsettled by the experience. I wasn’t at all prepared for the singing, dancing, squealing joy that accompanied the move. We really are most-very-extremely blessed with our three girls. It may be that five months of more-or-less continuous camping has had a not dissimilar effect on the girls as it has on us. Perhaps there is a fed-upness that contributed to their joy, but I will choose to believe that they’re just plain wonderful. We came, as I have noted previously, to East London (not the East End: East London, South Africa; eMonti; Buffalo City) for 10 days in October and stayed. We camped until the second week of December, then house-sat two beautiful houses over Christmas. We returned to our tents in January and, with the exception of many nights babysitting with Heather and Ian, camped on until mid-March. Which was well past our FOR GOODNESS SAKE STOP! CAMPING! NOW! date. We think, in retrospect, perhaps we should have moved sooner. Retrospect is enormously entertaining but only very occasionally useful. Which is all to say: there has been a grand adventure, and so of course a tale, which it seems will be related here in dribs and drabs. Suffice, for the moment, to say that I am surrounded by, buoyed up by, inspired by, four wonderful girls one of whom I am married to. I couldn’t wish for better companions in this adventure that is our life.